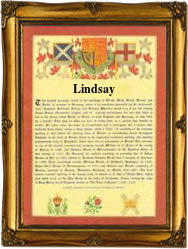 This interesting surname is of Old British and Anglo-Saxon origin, and is a variant of "Lindsey", an English locational surname from Lindsey in Lincolnshire, which appeared as "Lindissi", circa 730 in Bede's "Historia Ecclesiastica", and as "Lindesi", in the Domesday Book of 1086; or from Lindsey in Suffolk, recorded as "Lealeseia", circa 1095 in Documents from the Abbey of Bury St. Edmunds. The former placename in Lincolnshire derives from "Lindon", the Old British name for Lincoln, to which was added the Olde English pre 7th Century "eg", island; apparently, the district was practically an island, until the fens on the Witham were drained. The latter placename, in Suffolk, is composed of the Olde English byname "Lealla, Lelli", and "eg", as above; hence "the island of Lelli, Lealla". According to another source, the name may be of Norman locational origin, from De Limesay, Pays de Caux, Rouen, France. The first namebearer is recorded in the early 12th Century (see below), and his great grandson Sir William de Lindeseia was one of the hostages for King William the Lion of Scotland in 1174. Other early examples include Thomas de Lindesie (Lincolnshire, 1207) and Thomas de Lyndesey (Derbyshire, 1273). David Lindsay (1531 - 1613) was bishop of Ross, and chaplain to James V1; he accompanied the king to Norway to fetch his bride in 1589. The first recorded spelling of the family name is shown to be that of Sir Walter de Lindeseya, which was dated 1124, a witness in the Church Registers of Glasgow, during the reign of King David 1 of Scotland, 1124 - 1153. Surnames became necessary when governments introduced personal taxation. In England this was known as Poll Tax. Throughout the centuries, surnames in every country have continued to "develop" often leading to astonishing variants of the original spelling.